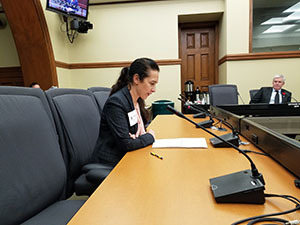 UFCW Canada’s Regional Director for Ontario, Debora De Angelis, addresses Standing Committee on Finance and Economic Affairs at Bill 148 hearing. Toronto – November 15, 2017 – UFCW Canada activists recently attended and presented at a public hearing on Bill 148, the Fair Workplaces, Better Jobs Act (2017), to demand card-check certification, automatic first contract arbitration, and pay equity for all workers in Ontario. Currently in second reading, Bill 148 is the Ontario government’s response to the Changing Workplaces Review and consultation process, which examined the province’s labour laws and standards for the first time in a generation. As a result of the review, the government has committed to improving Ontario’s labour laws by boosting the minimum wage to $15 by 2019, increasing vacation and personal leave entitlements, and enhancing union rights in some sectors of the economy. Equal pay for equal work, to guarantee that workers of all gender identities and job classifications are paid equally for performing similar or identical work. As well, thanks to the lobbying efforts of UFCW Canada activists, an amendment has been added to Bill 148 to enhance a provision that grants 10 days of unpaid leave to survivors of domestic and sexual violence. The new amendment ensures that 5 of those days would be paid, providing additional support to workers when they are trying to recover from abuse and find a new place to live. If Bill 148 passes, Ontario would become the third province to provide paid leave for survivors of domestic and sexual violence. "While our union welcomes many of the provisions included in Bill 148, much more needs to be done to enhance union rights for all workers, protect employees seeking a first contract, and ensure that workers performing similar or identical work are paid equally," says Paul Meinema, the National President of UFCW Canada. "That is why UFCW Canada is encouraging the Ontario government to fully utilize this once-in-a-generation opportunity to strengthen the province’s labour laws by mandating card-check certification, automatic first contract arbitration, and equal pay for equal work in Bill 148,” the UFCW leader adds.